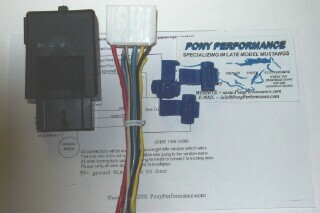 Want to add One Touch Down window control to your 94-04 Mustang passenger window ? Want to add One Touch Down to your 87-93 windows just like the 94+ ? Want to add One Touch Down to your F and E series trucks/vans, Super duties, T-Bird passenger windows ? This kit will allow you to do such !!!!!!! Simple 5 wire hookup with only 1 factory wire being cut, installs right at window switch.